A "boon" (noun) is something that is considered beneficial or helpful. 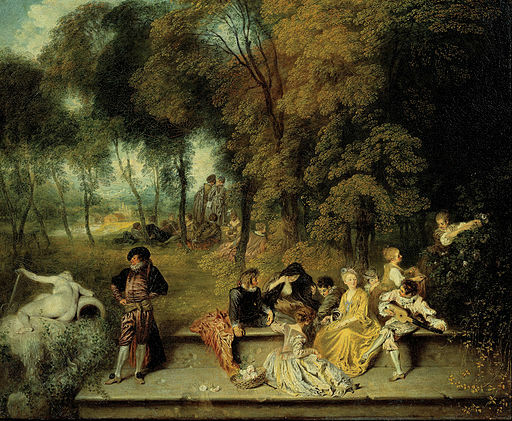 Antoine Watteau "Pleasures of Love"
He went out into the world and sought out the pleasures that youth delights in. But each in its turn was short-lived and disappointing, vain and empty; and each, departing, mocked him. In the end he said: "These years I have wasted. If I could but choose again, I would choose wisely. "Four of the gifts remain. Choose once more; and oh, remember-- time is flying, and only one of them is precious." The man considered long, then chose Love; and did not mark the tears that rose in the fairy's eyes. After many, many years the man sat by a coffin, in an empty home. And he communed with himself, saying: "One by one they have gone away and left me; and now she lies here, the dearest and the last. Desolation after desolation has swept over me; for each hour of happiness the treacherous trader, Love, as sold me I have paid a thousand hours of grief. Out of my heart of hearts I curse him." "The years have taught you wisdom--surely it must be so. Three gifts remain. Only one of them has any worth--remember it, and choose warily." "My name filled the world, and its praises were on every tongue, and it seemed well with me for a little while. How little a while it was! Then came envy; then detraction; then calumny; then hate; then persecution. Then derision, which is the beginning of the end. And last of all came pity, which is the funeral of fame. Oh, the bitterness and misery of renown! target for mud in its prime, for contempt and compassion in its decay." "Two gifts remain. And do not despair. In the beginning there was but one that was precious, and it is still here." "Wealth--which is power! How blind I was!" said the man. "Now, at last, life will be worth the living. I will spend, squander, dazzle. These mockers and despisers will crawl in the dirt before me, and I will feed my hungry heart with their envy. I will have all luxuries, all joys, all enchantments of the spirit, all contentments of the body that man holds dear. I will buy, buy, buy! deference, respect, esteem, worship--every pinchbeck grace of life the market of a trivial world can furnish forth. I have lost much time, and chosen badly heretofore, but let that pass; I was ignorant then, and could but take for best what seemed so." "Curse all the world's gifts, for mockeries and gilded lies! And miscalled, every one. They are not gifts, but merely lendings. Pleasure, Love, Fame, Riches: they are but temporary disguises for lasting realities--Pain, Grief, Shame, Poverty. The fairy said true; in all her store there was but one gift which was precious, only one that was not valueless. How poor and cheap and mean I know those others now to be, compared with that inestimable one, that dear and sweet and kindly one, that steeps in dreamless and enduring sleep the pains that persecute the body, and the shames and griefs that eat the mind and heart. Bring it! I am weary, I would rest." "I gave it to a mother's pet, a little child. It was ignorant, but trusted me, asking me to choose for it. You did not ask me to choose." Add The Five Boons of Life to your own personal library.